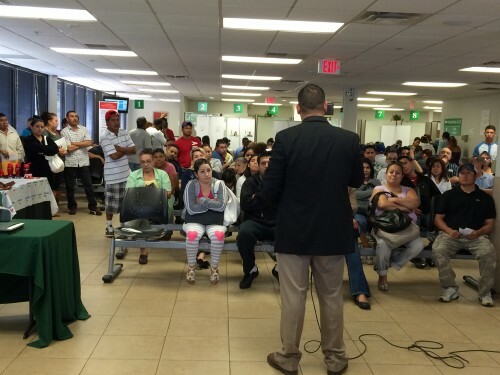 PHOENIX – It’s mid-morning at the Mexican consulate in Phoenix. Close to 200 people are seated in rows of metal chairs. They’re waiting for their names to be called for passports or consular IDs. On this day, there’s a guest speaker to talk to this captive audience, George Treviño. He’s wearing a suit jacket and a tie, which isn’t his usual look. Treviño is with the U.S. Border Patrol. But he’s trying hard not to intimidate anyone today. After all, many of those in the crowd are undocumented Mexican immigrants. Treviño is Mexican-American himself and a fluent Spanish speaker. “Buenos días,” his audience responded. The U.S. Border Patrol has garnered its share of criticism in recent years, particularly around agents’ use of lethal force. But the Tucson office, where Treviño is a border community liaison, has been trying to develop a more humanitarian reputation. It has launched a new program to have agents speak at the Phoenix Mexican consulate about the hazards of crossing the border in an effort to prevent migrant deaths. Treviño’s presentation in March was the third one of its kind. Treviño asked for a show of hands of how many people in the room came across the border either legally or illegally 15 or 20 years ago. Several hands went up. Treviño wanted to hammer home a specific point. “The border of the past isn’t the border we have now,” Treviño said. He explained it is much harder to cross today. He urged people not to encourage their relatives from Mexico to attempt the trip. He said there are more cameras, sensors and Border Patrol agents now. Plus, smugglers lie to migrants about the hazards of the journey, resulting in deaths in the Arizona desert. The Border Patrol is trying to reduce those deaths. One way is by setting up rescue beacons in the desert. Treviño said migrants in distress can see their lights from miles away. With the press of a button, they can summon help to be rescued. Laura Izela caught all of Treviño’s presentation. Izela said she likes that the Border Patrol is trying to save Mexican lives. But she is also still skeptical of the agency. Jorge, an undocumented immigrant from Morelos, also heard Treviño speak. He agreed the border has changed a lot since he crossed through eastern Arizona illegally 20 years ago. “It was easy,” Jorge said about that trip. He says it is good to warn people about the dangers today. But he says some people in Mexico need to get out and have no choice but to come through the desert. Apprehensions of Mexican migrants on the border have been falling since the mid-2000s, while the number of Central American apprehensions have been rising. On Arizona’s border, total apprehensions fell to the lowest number in years last year, while South Texas became more of a hot spot for border crossers from Central America. Seventy-eight percent of those apprehended in the Tucson sector were Mexican in fiscal year 2014. Felix Herrera of the Mexican consulate admits these presentations alone probably won’t alter the flow of illegal immigration. Which is why Herrera wants the word to get to would-be migrants to use the Border Patrol’s rescue beacons or dial 9-1-1 if they are in trouble. The stats do seem to be going in the right direction. Last fiscal year border deaths were the lowest they have been in 15 years. This story was reported by Jude Joffe-Block, in collaboration with Fronteras, The Changing America Desk, a consortium of NPR member stations in the Southwest. This entry was posted in KRTS News and tagged Arizona, Border Patrol, Border Patrol Use of Force, Fronteras Desk, health, Immigration, Mexico, Safety, US-Mexico Border. Bookmark the permalink.